Greetings from the more than 65,000 physician-members of the Canadian Medical Association. The speaker addressing the club as the 140th president of the CMA. The first president. The health of Canadians. An analogy. The Canadian health system that needs fixing. CMA solutions. People that distort the message – an illustrative analogy. How health care can be strengthened and renewed to meet the needs of Canadians. Canadian doctors committed to achieving that goal. Three important steps. An expansion on each of those steps. Recognizing that patients come first. What the Supreme Court of Canada has said. Frustrations with waitlists. What the speaker is promoting and not promoting in terms of health care. The need for leadership from our politicians. Some of the touch questions that patients ask every day. Some realities about private health care insurance. Canada Health Act’s five principles. Three of the eight principles that Tommy Douglas described as essential omitted from the 1984 Act. Bringing back those three principles. How to move forward in a practical way to help patients. Patient-focused funding. Access to health-care services. Doctors fighting on behalf of our patients. Addressing the extreme shortage of physicians, nurses and other health-care professionals. Debt of doctor graduates. Career choices. The demographic crisis of health care. What governments need to understand in terms of wait lists and their costs. Health-care services as an investment. Specific proposals for reform. Larry Mohr: President and CEO, Practice Solutions Ltd.
One definition of a Canadian is that we are disarmed Americans with free health care. Health care is certainly the issue of our time, and as health-care spending continues to take over provincial budgets across Canada, it has become very clear that our current system is broken and we urgently need to do something about it. Unless some fundamental changes are brought into the system, things will only get worse as we baby boomers age, people generally live longer and new treatments and technologies, wonderful as they are, continue to increase health-care costs. Despite these trends, the debate on this topic in Canada has contained much more heat than light. Many politicians and others want to maintain the status quo, pretending that things are just fine as long as we continue to throw more and more money at an increasingly flawed model. We have had study after study, most recently the Romanow report, which have more or less bolstered this point of view purely for political reasons. It is disappointing to say the least that most Canadians seem happy to accept this diagnosis as there doesn’t seem to be any great demand for an honest, factual, informed debate on this issue. But we can’t continue to keep our head in the sand without jeopardizing the system that Canadians hold so dear. Honest debate on this issue is exactly what is needed. Our speaker today has had the courage to confront the facts and propose solutions despite the many vocal naysayers trying to silence him. The fact that he was elected President of the Canadian Medical Association is, in my view, a positive sign that the medical profession itself realizes that new approaches are needed. Dr. Brian Day graduated in medicine in 1970 from the University of Manchester and, after pursuing post-graduate studies in England in internal medicine and surgery, he came to the University of British Columbia for a residency in orthopaedics. He began his medical practice at the Vancouver General Hospital and UBC in 1978. He has been a part-time professor at UBC since 1987, and has chaired several international seminars on arthroscopic surgery, and from 1989 to 1994 he chaired the orthopedic test committee for Canada’s Royal College of Surgeons. He has published more than 100 scientific articles and book chapters in areas of orthopedics, arthroscopic surgery and sports medicine. He has also been active on the editorial boards and committees of several scientific and medical journals. In 1995, Dr. Day founded the Cambie Surgery Centre, a private surgical facility. He is also a past-president of the Arthroscopy Association of North America, the world’s leading academic society in his field of practice. Dr. Day was only the second Canadian to have this post. He is here today in his capacity as President of the Canadian Medical Association for the 2007–2008 year. Please join me in welcoming Dr. Brian Day. Thank you very much. It is my honour to be speaking at the Empire Club and to bring greetings from the more than 65,000 physician-members of the CMA. I am very honoured to be the 140th president of the CMA. Our first president—Father of Confederation, Sir Charles Tupper—became Prime Minister of Canada. Of course, Canadians, in their collective wisdom, have chosen to never repeat the mistake of electing a doctor to the highest office in the land. 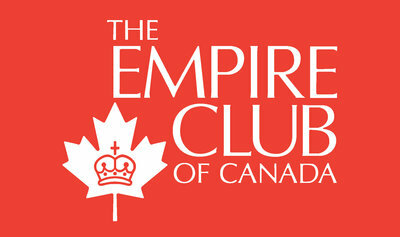 The Empire Club has a long history of providing a forum for the discussion of important issues and no issue is more important today than the health of Canadians. I am an orthopaedic surgeon—one of the “Doctor Fix-its” of the profession. We have a simple approach: when bones or joints are broken or not functioning properly, we try to fix them. By analogy, I don’t believe the Canadian health system is functioning well. It needs fixing. If I didn’t think that were possible, I would not have run for this job, and would not be here today. Supporters of the status quo reject solutions proposed by the CMA. In fact, they reject all solutions. When Mark Twain warned: “I’m all for progress; it’s change I don’t like,” he was surely referring to people like them. Many distort our messages. I’ll give you an analogy. This is, I’m afraid, a golf story. About six years ago I, a non-golfer, was coerced by friends to play in a charity tournament. In my first-ever 18 holes, I hit a hole-in-one. Today, if I hit a hole-in-one, there are some who would relate the story as “Brian Day, CMA President, doesn’t know how to putt”! I suppose that goes with the job. I’d like to speak to you today about how health care can be strengthened and renewed to meet the needs of Canadians. Canada’s doctors are committed to achieving that goal. There are three very important steps. Number one. We need a system that puts patients and their needs first. Not one that serves politicians, academics, ministry bureaucrats, hospital workers, or health professionals. The needs of patients must come first. Number two. We must reject empty political rhetoric and embrace renewal. The undue politicization of health care has resulted in a rich and successful country like ours having one of the most expensive yet least effective health systems in the developed world. Number three. We must see health-care funding as an investment. By investing in the health of Canadians, we can realize a significant return, both medically and financially. Let me expand on those points. Over the years, I have been called names like Dr. Profit and even the Darth Vader of health care. But I want to assure you that my goal, and the goal of the Canadian Medical Association, is to help improve our universal system, not destroy it. We want a system that recognizes that patients come first. Patients in Canada pay dearly both in taxes and out of pocket, yet they cannot access timely care. For Canada’s doctors, this is unacceptable. And it’s becoming more and more unacceptable to patients as well. Just over two years ago, the highest court in the land ruled that if the public system fails them, patients have the right to pay for private insurance for medically necessary care. This was a decision made by the Supreme Court of Canada—not by me, not by the CMA. That ruling dealt with a case in Quebec. Similar—and indeed more compelling cases—are coming soon in Ontario and Alberta. The lower courts will be bound to take guidance from the Chaoulli case. Patients should not have to sue for access. Governments appear to be in denial that Canadians cannot legally be forced to wait, suffer, and even die while they wait for health care. Frustrations with waitlists led me, in 1995, to help establish and become President and CEO of the Cambie Surgery Centre in Vancouver—the first private facility of its type in Canada. The motivation behind our group was simple. Our services were being rationed. Our patients were being shortchanged. Personally, my operating time dwindled from 22 to just five hours a week. That is 10 hours less than the minimum recommended for competence by the Canadian Orthopaedic Association. I had 450 patients waiting for care. I went into medicine to manage patients, not to manage wait lists. We built our own place to work because the public hospitals would not let us work there. We opened during the tenure of perhaps the most ardent NDP government that Canada has ever seen. Yet, our centre spawned others, and we have become a valuable part of the B.C. health system. As a result, I’ve been accused by unions, some so-called consumer groups, and even by a single-issue doctors’ group of promoting a so-called two-tier, American-style system. Let me be clear, I am not for an American-style system in Canada. It is true that I believe in competition. But not the type of unhealthy competition that seems to exist between Canada and the U.S. in health care. As two of the world’s richest countries, we seem to be in a race to the bottom when it comes to health. Canada’s health system has been ranked 30th by the World Health Organization, and the U.S. was ranked 37th. Why would anyone copy a system that ranks substantially below ours? I wouldn’t! And I don’t believe anyone here would. •	Why are a few selected Canadians—such as workers’ compensation patients, RCMP, and many others—allowed to access faster and better care? •	Why have the terms “medically necessary” or “required,” which are used widely in legislation, never been defined? And why are they applied differently across the country? •	How can crutches after breaking a leg or an ambulance for someone who has had a heart attack not be “medically necessary”? •	How can antibiotics prescribed to fight an infection, or painkillers to relieve pain, not be “medically necessary”? •	Why are patients charged for “upgraded” implants and devices by public hospitals, and a host of other items that are prescribed by their physicians? •	And what is the role of private medical insurance in Canada? Let’s face it. Some 70 per cent of all Canadians already have it, often labelled extended or supplementary health insurance. •	What about the underprivileged 30 per cent who don’t? Hypocritically, many of those who reject the concept of private insurance have it themselves. I have never heard one of them offer to opt out of their two-tier private plan on moral grounds. So let’s not pretend that it doesn’t exist. Let’s not pretend that it doesn’t cover medically necessary services. Instead, let’s figure out how to use it better. Those who speak against private insurance, user fees and co-payments need to recognize they are widespread and deeply embedded in our Canadian system. We need to act quickly on reform. The Canada Health Act’s five principles still provide a solid foundation from which to work, but we must now reframe those principles to recognize today’s health-care realities in the context of the 21st century. The principles were developed over 45 years ago at a time when there were no CT scanners, MRIs, by-pass surgeries, joint replacements and so on. As we seek to rework the act to reflect today’s context, it is interesting to note its basis is the 1961 Saskatchewan Medical Insurance Act of Tommy Douglas. Three of the eight principles that Tommy Douglas described as essential were omitted from the 1984 Act. Those three principles are: “Effective,” “Efficient” and “Responsible.” Bringing back these three “lost principles” will help ensure that the system is accountable to patients. The CMA, under the leadership of my predecessor Dr. Colin McMillan, recognized the challenges of putting patients first in the CMA policy paper Medicare Plus. The report was attacked by critics as “another call for privatization.” In fact it was a call to make the system work for patients, not the other way around. This is another sad example of how efforts to raise the real issues get lost in the clouds of negative rhetoric. So, how then do we move forward in a practical way to help patients? We need a system that treats health professionals, hospitals and, most importantly, patients, as value centres—not cost centres that consume an annual budget. We must expand the application of market and good business management principles. Our system of block funding, where a hospital receives an annual budget not tied to efficiency or productivity, is unique within the Organization for Economic Cooperation and Development (OECD). It is bad for management and bad for patients. The introduction of patient-focused funding with incentives or reward programs will encourage hospitals to become more efficient and more service-oriented. Patients will become a source of revenue, not a cost. Dollars would follow the patients. The elimination of wait times will save governments money. Governments need to understand that fact. Elimination of wait times will also open up new opportunities. For example, consider that the world’s biggest consumers in the $40-billion medical tourism business are Americans. This business has doubled in size this year, as half a million Americans travelled abroad for care. They went to places like Thailand, India, Europe and Russia. By changing our focus, we too could soon tap into that market and reap the rewards for our public system. This is a potentially massive new industry for Canada. A pre-requisite is the elimination of our own wait lists. Since Canada has virtually no non-government hospital infrastructure, the potential income from medical tourism will benefit public hospitals and unionized hospital workers. Naysayer union leaders need to reflect on this matter. It will not surprise any of you to learn that I do support an expanded role for the private sector. Again, let me be clear. Canada’s doctors believe that access to quality health-care services must be available to all Canadians based on need, not ability to pay. We also accept that if certain services can be delivered better, faster, and at less cost in the private sector, then the private sector must be engaged. Governments have a moral and fiduciary duty to use taxpayers’ resources wisely. The public/private debate in this country is, in my judgment, largely irrelevant. Much of the negative rhetoric is simply about defending unionized jobs. I understand why union-funded groups, such as various so-called health coalitions, continue to advocate for their members. These groups may label themselves as health advocacy groups, but in my mind, they are not. They are, pure and simple, union lobbyist groups, fighting for the rights of their members. That is understandable. It’s their job to advocate for union workers. However, as doctors, our job is to fight on behalf of our patients. Right now, the single most important factor in improving the system for patients is addressing the extreme shortage of physicians, nurses and other health-care professionals. In 1970, when public insurance was first fully applied to physician services in Canada, we ranked in the top four among developed countries in the number of physicians per capita. We now rank a lowly 24th. Each year, between 1993 and 2004, the equivalent of two full medical schools of graduates has left Canada. Fifty per cent of all newly trained orthopaedic surgeons and neurosurgeons leave within five years of graduation. They leave because we can’t offer them the resources they need to work. Doctors graduate with average debts of $160,000, and are forced to factor in their debt as they make career choices. In order to reach the OECD average of three physicians per 1,000 people, we would need 26,000 new physicians in the system right now! Now, counter that with the reality that demand for doctors in the U.S. is about to increase dramatically. Every U.S. presidential candidate is promising to provide insurance for the more than 45 million uninsured. The previously uninsured will use their insurance. A major supplier for the U.S. demand in medical manpower will be Canada. Health care is facing a demographic crisis as our society ages and we see more and more chronic diseases. The over-65 population in Canada stands at its highest-per-cent level in history, while the current under-15 population is at its lowest. There will be an astounding 43-per-cent increase in the over-80 population in Canada by 2011, and their health-care costs will create an economic crisis. In considering just one operation in my specialty—knee replacements—a projected 670 per cent increase will occur. How will we fund these operations, and where will the necessary doctors come from? We must achieve self-sufficiency in the number of health-care professionals we train. Ladies and gentlemen, we are at a pivotal point. We are just days away from a Speech from the Throne in which the federal government will set out its priorities for the next session of Parliament. It is vital that the federal government invest in making the health of Canadians a priority by targeting action and commitment in five key areas. The first is to completely solve the wait time and access issue. The establishment of wait-time benchmarks and wait-time guarantees were important first steps. A good start. But not enough. Wait-time guarantees must not mean guaranteed waiting. We must reject waiting periods that exceed all ethical and medical standards. They do not exist in many other countries with universal care, and they need not exist here in Canada. Waiting patients deteriorate as they suffer physical, emotional and financial hardship. Canadian and international studies have proven that wait lists impose a huge financial burden—many billions of dollars—not just on the health-care system, but on the economy in general. Governments need to understand that it will be cheaper to have no wait lists. Their elimination will prove a worthwhile investment. Spend that money now, not over a 10-year period. Patients will reap the health benefits, taxpayers will reap the financial benefits, and governments will reap the political benefits. Second, we must become self sufficient in the supply of health-care professionals. Up to five million Canadians do not have a family physician. Fourth, we ask that the federal government create targets for achieving significant reductions in illnesses associated with pollution and climate change. The environmental concerns that worry Canadians the most are those related to health. Finally, the government must support innovation and technology in health care. Investment in information technology will lead to better, safer and cheaper patient care. Studies show we rank at the bottom of the G8 countries in access to many new technologies. We spend a third of the OECD average on IT in our hospitals. This is a significant factor with respect to our poor record in avoidable adverse effects. I’m going to end my remarks by going back to where we started: We must put patients first. Sounds good—but how do we get there? We need not just visionaries to recognize and see, but pioneers to actually do what is right. We need action. We must reject empty rhetoric, and reward renewal. We can build a better system—one with enough resources to meet the needs of patients, be they children, those living in rural Canada or those with a chronic condition. We can generate those resources through savings achieved by the introduction of market principles into the acute-care system. We live in a very rich country. Canadians should not and need not wait for access. Governments have, for too long, looked upon health care as a “Black Hole” draining its resources. We must all reject that view and understand that health spending can be an investment. An investment that will pay massive dividends for the future. To our Prime Minister and to governments across the country I say: “The job is not done.” In fact, it has barely started, but we have the opportunity to fix our system right now. Governments must show leadership, now. The doctors of Canada are committed to the cause of renewing health care in Canada. The clock is ticking, and time is not on our side. Our system is not working well, but it can be fixed. Let’s fix it. Thank you.